I began my apprenticeship with Mark Shapiro around a year and a half ago with a mixture of excitement and apprehension. It had been a year since I graduated from college with a concentration in ceramics, and I decided that I wanted to return to that medium to explore it further. Choosing between an apprenticeship and graduate school was easy for me. Pragmatist that I am, I wanted to see the pottery business through the eyes of someone who had experienced and thrived in it first hand. Throughout this apprenticeship, I have been able learn all aspects of the business, not just the making of pottery. Because of this, I think I am much more prepared to take on this profession (if that is what I choose to do) than if I had attended graduate school. Having the liberty of free materials and space has allowed me to work under much less stress and encouraged me to take more risks with my work. I have been able to study Mark’s exceptional pieces up close and absorb some of his techniques and sensibilities. Watching a professional routinely make his way through problems and evolve his craft has been very encouraging for me. It gives me inspiration to continue through some of the challenging aspects of this apprenticeship. Juggling my work for Mark, my own craft, and my other part-time job has been a little overwhelming at times. Each part of my life is demanding in different ways and staying motivated and focused on all aspects has definitely been a challenge. I try to concentrate first and foremost on my pottery and retaining and creating my own style that will be necessarily influenced by Mark’s work, but hopefully not overwhelmed by it. Because there little uninterrupted time to produce my pieces, and because I am physically and mentally stretched, this is not easy. However, I do not think I would have it any other way. Seeing the reality of what it takes to support myself in this business and still being excited to come to work every day is revealing. Having an environment that is supportive, flexible, financially stable, inspiring, and yet realistic is invaluable. I would encourage anyone thinking of taking on pottery to complete an apprenticeship with a professional that they respect. For the past three years, I have worked as Mark Shapiro’s apprentice. The arrangement has been simple; in exchange for my labor in the studio, Mark provides me with studio space, materials, and a stipend. But the arrangement goes much deeper than this. As my mentor, Mark combines encouragement with thoughtfully-placed criticism as he assists me with the development of my own pottery. It is a selfless act, to teach someone in one sentence what may have taken you years to learn. Through this active exchange, Mark continues to influence my work. It is an influence I’m glad to have. But not all influence exists as an active verbal dialogue. More often than not, the dialogue is between the pot itself and the user. And in my case, I am having this dialogue with Mark’s pottery as it cycles through the studio, from raw clay to finished, wood-fired pot. 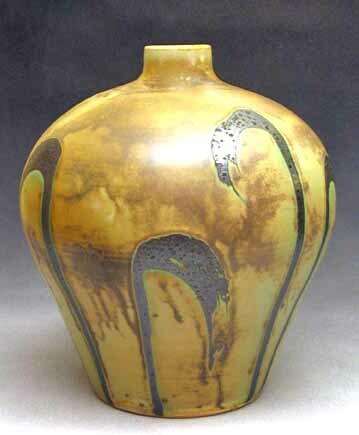 Mark’s pottery and his work ethic acts as an example. It is inspiring to see your mentor, a person whose pots you already admire, improve their own work. It sets a lifelong example as you realize the optimism of a job never finished and the possibility for unending improvement. When I began working for Mark, I wasn’t aware of the influences from Sam Taylor and Michael Kline. Although they no longer work in Mark's studio, their presence is still felt. Their pots line the studio rafters and fill his home. How can you not be influenced as you hold their beautiful pots in your hands nearly every day? And many of the studio habits are a collective of the years the three spent working and firing together. Want to see a trick?” Mark often asks. And then credits whichever of the three developed it. I am honored to have my pots alongside theirs.